Hi everyone, and welcome to this month's DIGI-MORPH CHALLENGE! I have participated in a bunch of DIGI-MORPH challenges here at TDP... but I have never hosted one before now! I find it so fun to see the different things that strike people when they see a layout and that they choose to use for their lift as one layout morphs to the next. The possibilities truly are endless! As usual, this game will last all month... or until the final layouts are submitted. All you need to do now is sign up below if you want to join in and we will assign you to a team. The game will start on September 5, so be sure to sign up by the end of September 4 if you want to participate! It's super easy to sign up. Just comment below and you are in! At the end of September 4, I will do a random drawing to mix up the teams. If you have any commitments during the month that could prevent you from being able to produce a layout in 48-72 hours, please let me know ahead of time (in your post, below) so I can try to accommodate your schedule. I offer no guarantees... but I will do my very best to make sure as many people as possible can participate! Are you new to DIGI-MORPH? 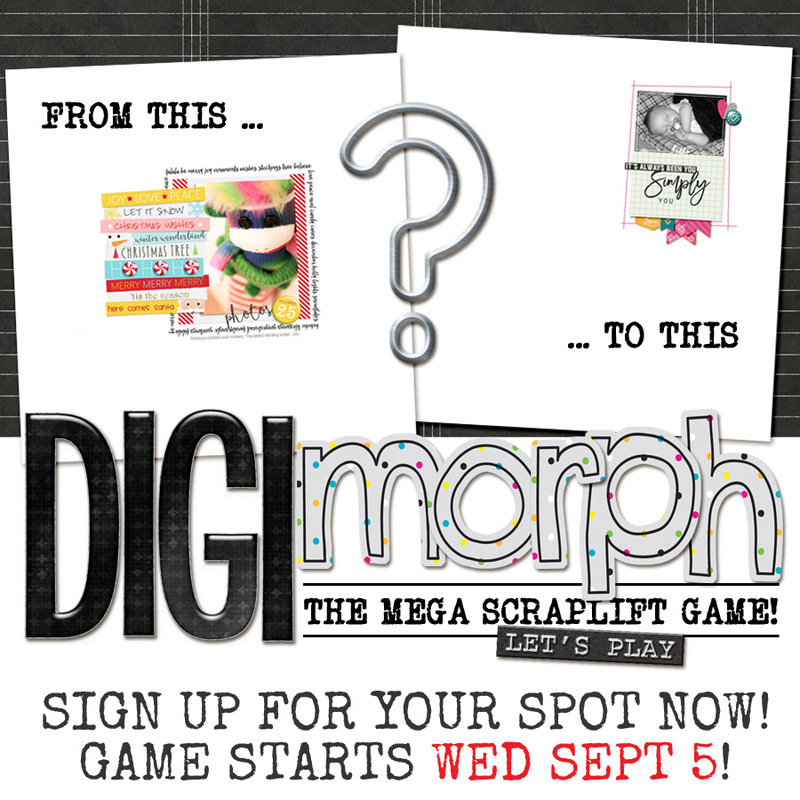 Let me give you a little background information: a digi-morph is a scraplift game - but it is super secret. Sssshhhh!! The game works like Telephone, but instead of saying a phrase to the next person, who says it to the next and so on, we will be secretly sharing a layout. I will pick a starter layout, pass it to the first person on each team's list. Each person will create a layout - a scraplift - inspired by the page that they receive from the person above them on their team's list (or me, in the case of those at the top of the lists). How or what you choose to scraplift from the layout you receive is entirely up to you; it might be the general page design, using the same kit, the same theme ... absolutely anything goes! Once person #1 is finished with their scraplift, that person will secretly pass their layout along to the next person, who does their scraplift ... on to person #3 ... and so on. At the end of the game we will have a reveal party and show the progression of the pages. The reveal is SO.MUCH.FUN as we look at how everyone interpreted the layout they received and the twists and turns of the design and layout from one person to the next. A quick note on layout sharing: we recommend sending a private message or e-mail because posting to a public site like Pinterest or Flickr is against the rules (as outlined below). NOTE: Anyone who completes their layout during the duration of the challenge throughout September will receive credit for this challenge. 1. If you want to play, you must be able to complete your page and send it to the next person in the chain within 2-3 DAYS. This will ensure the game keeps moving along. Now, let's say "life happens" (it happens to all of us!) and you won't be able to get your layout done in a couple of days. Just send me a message and I'll move you to the end of the list/group so you can still participate. If you know you have something big coming up this month, please let me know so that I can try to work around your schedule as I build the teams. Also know that some teams have completed the entire chain within a few days so a conflict later in the month may not be a showstopper. Please, please, please, if you sign up to participate, make sure to regularly and frequently check your PMs here or wherever you ask people to contact you. Good communication makes this game go quickly and with less stress for everyone. 2. Remember, this is a SECRET game ... there will be no sharing of layouts in ANY PUBLIC FORUM including the TDP gallery until the end and the reveal thread has been posted. This is often the most difficult part of the game for those of us who have little patience and/or made an awesome layout that is just begging to be shared ... but just wait. You can do it. I know you can! You've got all the info, and you're ready to get started. So, ready......set......go! Let's get this party started with sign-ups below! Last edited by Laura Passage; 09-01-2018, 01:23 PM. I'll play! Going earlier in the month works better for me. Sign me up please, the earlier in the month the better. Totally in! I will be out of the country between Sept 15 and 23, so I would love it if I could be toward the top of any list! I'm in! this will be my first time! !